A perennial problem confronting Chronology Compilers in the Earth Sciences are the years with double or triple [or more] layers caused by unseasonal periods of weather such as Indian Summers and Blackberry Winters. Undetected multiple layers turn a Gold Mine of information into Fools Gold which can then transmogrified into Settled Science by the Earth Scientists. Blackberry winter is a colloquial expression used in south & midwest North America, referring to a cold snap that often occurs in late spring when the blackberries are in bloom. Lake varves can be challenging for Chronology Compilers because an “annual layer” is usually deemed to be composed of “a pair of layers” that may be less than a millimetre thick. A varve is an annual layer of sediment or sedimentary rock. Varves are amongst the smallest-scale events recognised in stratigraphy. An annual layer can be highly visible because the particles washed into the layer in the spring when there is greater flow strength are much coarser than those deposited later in the year. This forms a pair of layers – one coarse and one fine – for each annual cycle. Varves form only in fresh or brackish water, because the high levels of salt in normal sea water coagulate the clay into coarse grains. Varves extracted from headwater lakes can be especially challenging because water level fluctuations can disturb depositional dynamics or even create a depositional hiatus. A grass valley (also vega and valle) is a meadow located within a forested and relatively small drainage basin such as a headwater. Grass valleys are common in North America, where they are created and maintained principally by the work of beavers. Rarely, they are associated with cienegas. Ciénagas are usually associated with seeps or springs, found in canyon headwaters or along margins of streams. Ciénagas often occur because the geomorphology forces water to the surface, over large areas, not merely through a single pool or channel. A rhythmic spring (also: ebb and flow spring, periodic spring, intermittent spring) is a cold water spring from which the flow of water either varies or starts and stops entirely, over a fairly regular time-scale of minutes or hours. The Gihon Spring or Fountain of the Virgin in the Kidron Valley was the main source of water for the Pool of Siloam in the City of David, the original site of Jerusalem. The spring has the singular characteristic of being intermittent, flowing from three to five times daily in winter, twice daily in summer, and only once daily in autumn. A particularly fine study of varves from the headwater Elk Lake was published in 1994. In this report we present the initial results of analyses of contiguous samples, each a composite of about five years, to document a high-resolution paleolimnological history of the past 1500 years in Elk Lake. Elk Lake (latitude 47°12′ N., longitude 95°15′ W.) is part of a complex drainage system that forms the headwaters of the Mississippi River in Itasca State Park, Clearwater County, northwestern Minnesota. Elk Lake drains through a small stream, Chambers Creek, into Lake Itasca which has been designated as the headwaters of the Mississippi River. The rolling topography of the Itasca Park region, with many low hills, lakes, and wetlands, developed on the Itasca moraine. One of the more interesting aspects of this Elk Lake study is the “weighted smoothing” used to reveal “prominent oscillations in thickness” with “an average period between 40-50 years”. Plots of both varve thickness and gray-scale density reveal quasi-periodic patterns of oscillation that probably reflect responses by the lacustrine system to changes in climatic variables at different time scales. For example, a plot of varve thickness with 2% weighted smoothing (Fig. 8) has an average varve thickness of about 1.6 mm, reveals a long-term trend toward thicker varves with decreasing age, shows several long oscillations of 500 and -200-300 years, and also displays about 27 to 30 prominent oscillations in varve thickness with an average period between 40-50 years. This 40-50 year cycle period is well developed between 200 and 700 varve years, and plots of measured values (Fig. 9) and of 4% weighted values (Fig. 10) of varve thickness for this time interval show cycles in varve thickness with amplitudes of up to 1.0 mm. Plots of raw and smoothed gray-scale density values of the interval from 200 to 700 varve years (Figs. 11 and 12) reveal a similar pattern of 40-50 year oscillations but with no obvious relationship between values for varve thickness and gray-scale density. This prominent oscillation of “40-50 years” is particularly curious because it’s about twice the length of the Hale Solar Cycle that has a period of between 20 and 24 years. Hale’s observations revealed that the complete magnetic cycle spans two solar cycles, or 22 years, before returning to its original state. The application of a “weighted smoothing” technique is [also] particularly intriguing because it appears to act as some kind of Weighted Moving Average with predictive powers. A weighted average is an average that has multiplying factors to give different weights to data at different positions in the sample window. Mathematically, the moving average is the convolution of the datum points with a fixed weighting function. Thankfully, the documentation includes the raw data for some Reality Checks. The raw data reveals some very unexpected information like a significant outlier varve thickness in 1112 AD and a [suspect] zero thickness varve at 1410 AD. The raw data also reveals some interesting information. Identifying the varves for these years must have been especially challenging with the varve thicknesses ranging between 0.12 and 0.08 of a millimetre. The varve thickness for this year is 1.60 millimetres but the Cumulative Thickness is incremented by 10.53 mm. This artefact is suggestive of a spreadsheet formula error. Throughout the raw data there appear to be rounding differences of 0.01 in the Cumulative Thickness column that suggest the varve thicknesses were entered into a spreadsheet with a accuracy of more than two decimal places. Overall, the Elk Lake chronology displays a remarkably constant accumulation rate over many long centuries even when the 1410 AD and 1112 AD outliers are included. This constant accumulation rate can be validated by checking whether [or not] the varve thicknesses create a Normal Distribution that resembles a Bell Curve. Normal distributions are important in statistics and are often used in the natural and social sciences to represent real-valued random variables whose distributions are not known. The normal distribution is sometimes informally called the bell curve. In fact, the distribution of varve thicknesses indicates there are numerous years with undetected multiple layers because of it’s unbalanced Low Side Lean and curious Flat Peak. (3) a tropical air stream that brings warm, moist air northward from the Gulf of Mexico especially during the summer months (Bryson and Hare, 1974). Depending on the season, the presence and interaction of these different air masses characterize the climate of northwestern Minnesota (Anderson and others, 1993a). The dry, warm Pacific air mass forms an eastward-pointing wedge that reaches the north-central United States in winter, and retreats northward into Canada in the summer. The main role of the Pacific airmass on the climate of the Elk Lake region occurs when it entrains and lifts moist Gulf air to produce heavy snowfall. The arctic air mass also prevails in the Elk Lake region during the winter, although outbreaks of arctic air do occur in the summer (Baldwin, 1973). Incursions of arctic air usually follow heavy snowfalls produced by the interaction of the westerlies and the Gulf Coast air creating sever blizzard conditions with deep snow drifts. The warm, moist tropical Gulf air mass does not usually invade northern Minnesota during the winter, but during the summer, circulation around low-pressure systems moving from west to east across continental United States causes substantial northward flow of moist air from the Gulf of Mexico into the Elk Lake region. 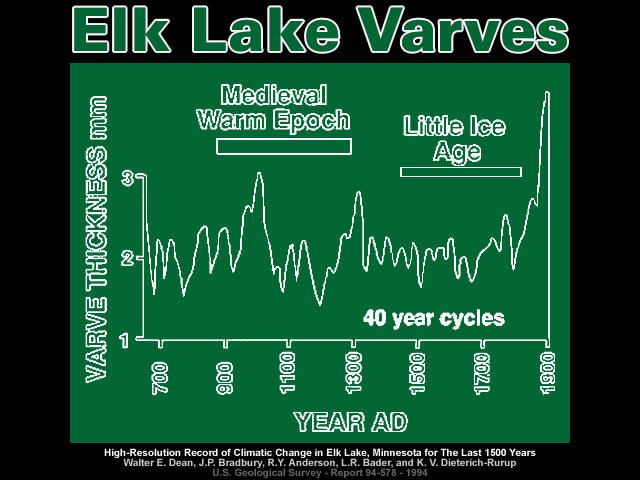 If this assessment is correct then most of the deeper Elk Lake varves [deemed to be many thousands of years old] are actually from the very turbulent 1st millennium CE. 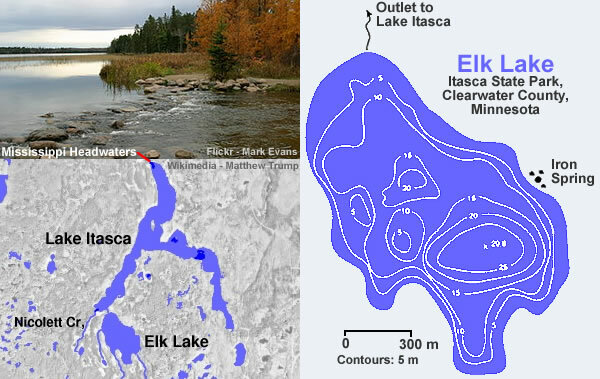 The depositional dynamics of Elf Lake are very curious as it was once part of Itasca Lake and during “copious rainfall” Itasca Lake is known to flow into Elf Lake. ELK LAKE AND ITS CREEKS. An eroded surface, where formerly existed a narrow shoal, has created the bed of Chamber’s creek, 1,100 feet long, connecting Elk lake with Itasca lake. That it was, formerly, a part of Itasca lake, will be readily admitted by the casual observer; an estuary, cast asunder by the gradual lowering of the surface of the parent lake, from protracted natural causes, leaving it 493 feet distant, and 12 inches higher, with, a separating narrow strip of land intervening, at Morrison hill. Elk lake covers an area of 294 acres, is a mile in length, and seven soundings, through openings in the ice cut for that purpose, gave an average depth of 32½ feet. In the summer of 1890, after copious rainfall, Lake Itasca rose a foot or more above Elk lake, and Chambers creek flowed into instead of out from it, a certain indication that Itasca lake draws its principal supply from beyond the narrow limits of Elk lake. Gallery | This entry was posted in Arabian Horizon, Books, Deranged Dating, Heinsohn Horizon, History, Old Japanese Cedar Tree, Varves. Bookmark the permalink. Histograms from Lake Gosciaz sediments showing natural Bell Curve distributions. Clearly, every scientific sediment study should include this type of analysis.